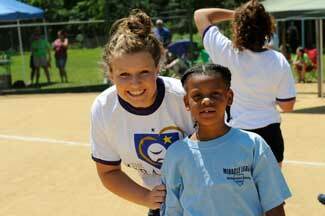 The Miracle League has many volunteers in each league that are so important to the success of the program. The Angels in the Outfield or in some cases called “Buddies” are extra special to the children playing baseball. They are the ones who team up with each player to help the children in the outfield and help them around the bases when they get that all important hit. As part of the July 2011 Diamond Dreams Baseball and Softball Charity Marathon an exhibition Miracle League game was played. 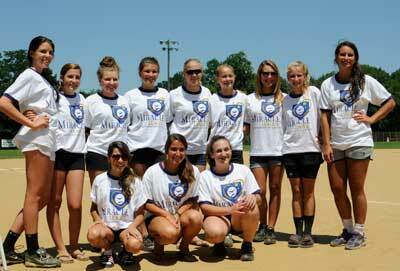 The Angels were members of the softball teams that played from Saturday night to Sunday morning. Being able to do this for the first time touched each of their hearts and one of the members, Rachel Young, wrote a paper for her school class that expressed her feelings towards being a true Angel. There are over 500 million disabled people in the world, nearly 24 million in the United States, and 1.6 million in Pennsylvania. Many of the disabled are kids who grow up unable to participate in many of the things we take for granted. I believe that we need to accept people’s differences and give them the same opportunities we have. I believe in miracles. As a young child, I grew up around my Uncle who was severely autistic. I had quickly learned that not all people are the same and we need to accept them as they are and not as what we think they should be. My Uncle could not eat, drink, walk, or even go to the bathroom by himself. He couldn’t talk, but he taught my whole family many life lessons, always made us laugh, and never failed to keep a smile on our faces. My Uncle died in December of 2009 and he is my driving force to give other kids the opportunities that they normally wouldn’t have and the opportunities he never had. Over the summer, I participated in an “Up All Night,” softball tournament in which my team played at 10 p.m., 12 a.m., 2 a.m., 4 a.m., and in the championship game at 8 a.m. This was a fundraiser for the Miracle League of Northampton County, which is a baseball league for physically and mentally disabled kids. The Miracle League gives these children a chance to experience playing a sport, something many of us take for granted. Even though a two inning game may not seem like much to us, it means the world to them. When my mom was a kid, she used to take my Uncle George to the park so he could play just like all the other kids. Some of the kids at the park were making fun of my Uncle, who is my mom’s brother and she instantly ran home crying. The Miracle League gives disabled kids a place they can go with other kids with similar disabilities and be active. They get treated like any other athlete with many fans cheering them on. Seeing these kids and young adults get a chance to play a two inning baseball game is truly remarkable, and being involved is an honor. “If I were to tell you about an organized youth baseball league, you might call it ordinary. If I were to tell you the athletes are physically and mentally challenged, you might call it touching. If you were to see them play, you would call it a miracle.” (The Miracle League.) I believe that we need to accept people’s differences and give them the same opportunities we have. I believe in my Uncle George. I believe in miracles.